JUST WHO IS DR. BRUCE? Exercise Physiologist, Fitness Industry Product Entrepreneur, Personal Training Expert, World Record Setting Coach, and Endurance Athlete Extraordinaire…That’s Dr. Bruce! 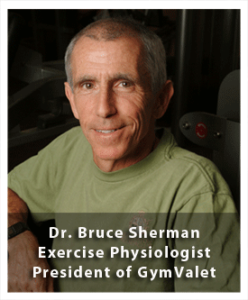 For more than 30 years, Dr. Bruce, a.k.a., Bruce A. Sherman, Ph.D., has worked to promote and enhance physical fitness, athletic training, nutrition, and overall wellness for people everywhere. He is an internationally recognized expert in his field, and a virtual encyclopedia of facts, figures and insights on nearly all facets of personal health and fitness as well as health and fitness facility operations and cleanliness. Included among the achievements he is most proud of is his work as a successful coach and trainer, and being the inventor of a cutting-edge fitness product—the GymValet. On a personal level, he is a very accomplished and decorated endurance-sports athlete. People are continually astounded by the scope of Dr. Bruce’s scholarly knowledge, the depth of his industry-specific perspectives and experience, his feats of athletic endurance, and his uncanny ability to break down complex information and issues into bottom-line, common sense advice. Ask him a question – any question – about exercise and competitive training, about good and not-so-good foods, about employee wellness strategies, about health club operations – even about your golf swing. It’s likely that Dr. Bruce has a great answer. Dr. Bruce received his B.A. in Biology from Miami University, in Oxford, Ohio, and his M.A. and Ph.D. in Exercise Physiology from Kent State University in Kent, Ohio. He feels that the world of academia opened his eyes to the world of possibilities, in health and fitness endeavors, where he gets to apply his unique skill-set on a daily basis. As a personal trainer, Dr. Bruce has worked with clients of all ages and levels of health and fitness – from elite athletes to wheelchair bound individuals, and from children to young adults and nonagenarians (people over the age of 90). Dr. Bruce possesses specialized expertise in corporate and worksite wellness and has worked with dozens of professionals and organizations throughout his career. In the late 1980s, he pioneered a unique on-site corporate wellness assessment program that thoroughly evaluated specific employee health and wellness levels through cholesterol, blood pressure and body composition analysis screenings. Combining that data with a health risk appraisal tool, Dr. Bruce provided employees with an in-depth report on their current state of wellness and gave them the appropriate strategies to live healthier lives. He also counseled employers on strategies to provide healthier work environments for their employees. Dr. Bruce possesses 27 years of experience as a boys and girls high school track and cross country coach–a job he loves! He has coached athletes to numerous school records and impressive performances at the state level. He is currently serving as Assistant Boys and Girls Track Coach at Beachwood High School, his Alma Mater. In 2017, with his assistance, the Beachwood girls’ team won the Ohio High School Athletic Association state team championship—the first state championship by any Beachwood team, in any sport, in the 56 year history of the high school. In the summer of 2017 Dr. Sherman coached 96 year old sprinter Diane Friedman, from Lyndhurst, Ohio, to shatter the National and World age group records in the 100 and 200 meter dashes for women in the 95-99 year old age group. More notable is the fact that records were achieved in the same track meet, less than 30 minutes apart. For Diane’s accomplishments, Sherman nominated her for inclusion in Sports Illustrated’s Faces in the Crowd. Thirty five days after Diane’s record breaking performances she appeared on page 28 of the September 4, 2017 issue! As an ultra-endurance running and cycling event consultant, coach, planner and participant, Dr. Bruce has worked with local and national individuals and organizations to plan and provide technical support and expertise for many unique ultra-endurance running and bicycling events. These events and individuals call upon Dr. Bruce’s specialized expertise in exercise physiology, coaching, nutrition and sports psychology in order to help ensure a successful, fulfilling and safe experience for the participant(s). Here are a few examples: 1) In 1990, Dr. Bruce participated in Marathon DesSables, a 135-mile self-supported seven-day stage running-race across the Sahara Desert in Morocco. In addition to advising several athletes in the race, Dr. Bruce was the second American finisher; 2) Dr. Bruce also has been a six-time Crew Chief for individuals and teams participating the Bicycle Race Across America (RAAM), a non-stop, 3,000-mile, transcontinental bicycle race. Dr. Bruce has served as the former Fitness and Aquatics Director for the Department of Intramurals at Kent State University. During his tenure, he built the largest university-based group exercise program in the United States. Under his guidance, 38 instructors taught a variety of classes at facilities across campus. He is most proud of the largest single class in the program’s history, featuring 408 participants and three instructors. Dr. Bruce also worked as the Fitness Center and Personal Training Director for a major health and fitness facility in Cleveland, Ohio. Additionally, Dr. Bruce has taught review courses for aspiring personal trainers in preparation for taking their A.C.E. certification exams. Dr. Bruce maintains a firm belief that better fitness leads to better golf. He is fascinated by the direct correlation between physical limitations and golf swing faults (and vice versa). This fascination led him to become certified as an Advanced Golf Fitness Instructor through the Titlist Performance Institute. He formerly served as a member of the teaching staff of the Cleveland Metroparks Academy of Golf. Dr. Bruce believes that the experience of exercising in a fitness facility should be safe, efficient, effective and enjoyable. He also believes that products designed to accomplish these goals are vital for the continued success of the health and fitness club industry. But words alone aren’t enough; Dr. Bruce has taken action. Having spent years in and around fitness facilities of every shape and size, Dr. Bruce came to recognize a fundamental problem. Time and time again, exercisers who wanted to clean and sanitize a piece of fitness equipment before and/or after using it had to walk across the fitness center hunting for sanitizing supplies that resided on a remote shelf, window sill or wall. Or, they had to tread carefully through their workout, being careful not to trip on cleaning supplies that were randomly strewn on the floor between equipment. Surely, he thought, a sanitizing supplies holder existed that could be attached directly to each piece of equipment. Yet in reality, such a product hadn’t been invented, so Dr. Bruce decided to develop one – specifically, a spray bottle and towel holder that could be conveniently and cost-effectively attached to every type and piece of strength and cardio fitness equipment. The result is the GymValet®, a holder for sanitizing spray bottles and towels that is easy-to-install and universally attachable to virtually all makes and models of exercise equipment. Its multi-purpose design makes it the perfect solution for holding fitness equipment sanitizing supplies. 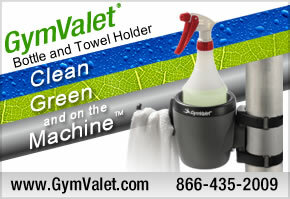 The GymValet makes it fast and convenient for exercisers to clean equipment before and/or after use. Equally important, it eliminates the need for high-cost disposable paper towels and pre-moistened wipes, and it creates no paper waste. Dr. Bruce has run at least three miles every day, without fail, since May 16, 1978. That’s almost 40 years, or close to 15,000 consecutive days of running, without missing a single say—ever! In all the time that has elapsed since May 1978, Dr. Bruce estimates that he has run approximately 100,000 miles. That’s the equivalent running four times around the Earth at its greatest circumference. And, just to add some local context, since he is a native Clevelander, he began his consecutive day running streak 2,421 days before LeBron James was born. Dr. Bruce is currently ranked 19th on the United States Running Streak Association’s (USRSA; www.runeveryday.com) list of active running streaks. The Association defines a running streak as running at least one continuous mile within each calendar day under one’s own body power (without the utilization of any type of health or mechanical aid other than prosthetic devices). Dr. Bruce has completed 20 full-length marathons with a personal best of 2:34:45 (that’s an average of 5:54 per mile for 26.2 miles). Dr. Bruce was among the top 20 nationally ranked age group Olympic distance triathletes in the 1990s. He was a two-time gold medalist in long-distance running in the 1993 World Macabbiah Games – the Olympics for Jewish athletes. He was a three time finisher in the Empire State Building Run-Up, which involved running up 86 floors, or 1,575 steps, from the building’s lobby to the 86th floor observation deck. Dr. Bruce’s best finish was 3rd place overall, and his best time was 12 minutes and 13 seconds. He is a two-time Badwater 146 participant (1989 and 1991). The Badwater event is av146-mile foot race from Badwater, in Death Valley, California (the lowest point in the western hemisphere) to the summit of Mt. Whitney (the highest point in the contiguous U.S.). Bottom line: The race traverses from 292 feet below sea level to 14,494 feet above sea level during the course of 146 miles. Other notable races in which Dr. Bruce has participated include the 1993 Himalayan Run & Trek, a 100-mile, five-day stage race in Northern India, and World Ride ’95, a 13,000-mile, 14-stage around-the-world bicycle ride for able-bodied and disabled athletes. Dr. Bruce was personally involved in the stage from Uulan Batar, Mongolia, across the Gobi Desert to the Great Wall of China near Beijing.